Depending on the country, currency exchange rate and your own spending habits, studying abroad can look expensive. But as a La Trobe student, you are entitled to apply for mobility grants and scholarships that can help ease your transition to studying in another country. All eligible students will receive the minimum of a mobility grant but may be able to apply for alternate higher funds. You can never start your application too early, though you may need some details from your host institution for some scholarships, if you are unsure, please contact us. Students receiving any of the main scholarships below cannot also receive a mobility grant. You cannot receive more than one of these scholarship within the same La Trobe degree. If you have received a New Colombo Plan (NCP) mobility scholarship for your semester exchange, then you will not be able to receive these scholarships in subsequent exchange semesters within the same La Trobe degree. All eligible students will receive the minimum of a mobility grant but can apply for other scholarships and funds below. Successful applicants will receive their mobility grant via electronic transfer to the nominated bank account upon commencement of their program. There is no separate application for this grant and the payment will be automatically requested upon confirmation of student arrival at the host institution. This payment process takes approximately 3 - 4 weeks following the confirmation of arrival at the host university (please refer to the arrival information page for more information). Some mobility grants may be deducted from a La Trobe program cost instead of being paid to students. Mobility grant availability is conditional on University budget approval processes. Students receiving an alternate grant through La Trobe Abroad such as the New Colombo Plan (NCP), Endeavour or Student Mobility Scholarships listed below cannot receive a mobility grant. Students only receive one kind of Australian-based funding from La Trobe University. Students doing an additional exchange semester will receive a mobility grant of A$500 only during their second semester. Please refer to the Student Mobility Grant Policy in the La Trobe Policy Library for more information regarding your eligibility. The Strategic Mobility Scholarship (SMS) awards A$5000 towards a semester/full year exchange program to students who apply for one of the identified priority exchange partnerships. These priority exchange partnerships are subject to change each semester. Approximately 14 scholarships will be available for each semester. Students applying in their second exchange semester must meet all of the criteria below and the institution of their program must be listed in the priority institutes linked below. Your potential to successfully complete a full-time semester of study in an unfamiliar environment from which you will benefit both academically and personally, as well as acting as an ambassador for Australia and for La Trobe University. It is essential that you include supporting documentation with your application. Please refer to the application document for specific details. If your official transcript is not ready at the time of submission, please ensure that you print out a copy of your unofficial transcript, which you can request through your Student Online Account. The decisions of the SMS committee will be final. The Academic Mobility Scholarship (AMS) awards high achieving students a A$7000 scholarship towards a semester/full year exchange program. Approximately 7 scholarships will be available for each semester. Students applying in their second exchange semester must meet all of the criteria below. It is essential that you include supporting documentation with your application. Please refer to the application document for specific details. Note that a CV is also required as an additional part of the application documents. If your official transcript is not ready at the time of submission, please ensure that you print out a copy of your unofficial transcript, which you can request through your Student Online Account). If you are shortlisted by the AMS committee, the final stage of the selection process may include an interview. Regional campus interviews may be held at Bendigo campus or via phone interview. Failure to attend the interview will result in your application being cancelled. Decisions of the AMS committee will be final. For Semester 2, 2019 & Semester 1, 2020 we have received funding from the Australian government for semester exchanges under New Colombo Plan (NCP) and Endeavour Cheung Kong (ECKSEP) funding schemes for select countries and partners. These are very prestigious grants that may include networking receptions where student recipients are recognized by the government and other key stakeholders. You will also receive a special certification once you have finished your program which will add much weightage to your future career. an Australian citizen enrolled at La Trobe University. undertaking a Bachelor or Bachelor Honours degree program onshore at an Australian campus. Recipients will be determined based on the number of applicants who meet the La Trobe Abroad eligibility for exchange. If there are more applicants than grants, we may hold interviews and review based on the Selection Criteria under the NCP Program. Students who apply for the Countries and destinations mentioned above and have a 70% weighted average mark will be prioritized. Complete the Exchange Application Form and submit it to La Trobe Abroad before standard exchange application deadline. This grant would replace the standard Mobility Grant. These scholarships are paid in addition to the mobility grant or other La Trobe University mobility scholarships listed above. The Student Mobility Assistance Scholarship is a one-off payment for students who are facing financial difficulties which may impact on their Exchange experience. The amount of payment may vary, and you will be contacted with an invitation to apply if any funding becomes available. Please note, this scholarship will be paid in addition to the mobility grant or other La Trobe University mobility scholarships. This scholarship is open to domestic students only. What is the Hallym International Dormitory (HID)? Hallym International Dormitory (HID) is an intensive language and culture program in Hallym University. Hallym students who are interested in developing their language and cultural understanding live and study together with visiting exchange students. The dormitory is organised into four different language sections (English, Chinese, Japanese and Russian). The dormitory itself houses approximately 160 students, 25 per cent from other countries with the majority from Korea. Exchange students in the English section are not necessarily from 'native speaking' countries; but have good quality English skills and are able to assist the Hallym students with their language. Exchange students receive a comprehensive immersion into Korean culture through living with students who are best suited and motivated to communicating and understanding visitors to Korea. Because all of the students work together, HID is considered to have much more of a community than the regular dormitories. What is the role of exchange student tutors? Attend five hours of class/seminars per week. Classes focus on understanding current issues. The work is designed to encourage students to look at topics and issues in different ways and from a different cultural perspective. Seminars are held during the evenings in groups of six or seven. In class, exchange student tutors are required to participate and assist the Korean students. In seminars, exchange student tutors will help organise and lead the study group. Attend a small number of events throughout the semester that all students are encouraged to attend. Assist students with their language development and cultural understanding. This is usually done on an informal basis. What are the benefits of living in HID? Free accommodation for the whole semester. A scholarship of between KRW400,000 and KRW800,000. The final amount depends on an assessment of your participation in the program. Most students also consider the friendships, help, and memories the most rewarding aspect of their time in HID. For more information, visit the HID website. We require tutors to be proficient in English and able to advise others on their language development. We also require tutors to be competent at organising and managing small study groups. In order to assess these qualities, we invite all applicants to a telephone interview with a teacher from the course. The Asia-Pacific Economic Cooperation (APEC) participating economies, including Australia, have partnered with universities and companies to create new study and work opportunities. Check the APEC website to see what opportunities are available for students studying in Australian universities. If you decide to apply for one of the above partner universities, the Coordinator at La Trobe Abroad will check with the host university if any scholarships are available at that time. If your application gets approved, your Coordinator will inform you about the possibilities of getting a scholarship. Due to limited availability, if necessary a selection process may take place based on overall grade average (WAM). Please come speak to the Coordinator for Europe during Global Lounge open hours or send an email to studyabroad@latrobe.edu.au if you have any questions. As a La Trobe University student, your membership has already been arranged with Global Society. They may get in touch with scholarships depending on the funding available. To learn more about the Global Society and access their forums. Walter Mangold Language Scholarships are available to full-time students of modern languages, who are approved, or in the process of applying for a language exchange or study abroad semester overseas in semester 2, 2019. A Language Scholarship offers exchange students amounts up to $20,000 toward travel and living expenses while they are enrolled in an approved, accredited language and cultural program for one or two semesters, commencing overseas in semester 2, 2019. Interested candidates should consult the 2019 Walter Mangold Flyer [PDF 151KB] or the 2019 Scholarship Guidelines for how to apply. Applications close on Wednesday 27 March 2019. These are all in addition to any mobility grant or scholarship(s) listed above. Domestic students may also apply for the interest-free OS-HELP Loan for additional financial support. You can apply for this loan after your subjects have been approved for credit (see step 1 of the application process). If you need to follow-up for the status or payment of your application, please submit an online query form with all your program information. Students who receive youth allowance or other government funding can usually continue to receive these benefits when overseas. You will be able to apply for the Centrelink Letter after you have been approved by the host institution for your overseas program. Please make enquiries about your specific cases with Centrelink directly. Note: La Trobe Abroad does not administer or review Centrelink processes.“ before the text “please make enquiries about your specific cases with Centrelink directly”. All students (both domestic and international) are covered by La Trobe University’s insurance from 10 days before overseas program commencement until 10 days after the program ends. You will still need to purchase insurance if you are travelling for more than 10 business days either side of the program on personal travel. Please note, limited cover applies to students travelling to their country of residence see Travel to Country of Residence Policy [371 KB]. The summary of the insurance policy is available. 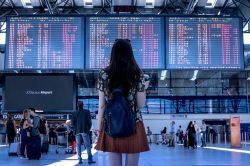 If you choose to work while you are away, it is important to investigate and understand that work rights for international students vary from country to country. For further information about your visa please contact the consulate or embassy of your host country. Grant payments are usually received 1-3 weeks before the program, if the full application documents are received on time. The payment will be arranged automatically after all your short program application documents have been received and approved by La Trobe Abroad. There is no separate application for this grant. You must submit all your short program application documents at least eight weeks before the commencement of your overseas program. No grants will be considered if you submit your application after the commencement or completion of the program overseas. It will also not be paid if you have any outstanding documents for La Trobe Abroad. Refer to the How to Apply Page for the full application process. It can take approximately 3-4 weeks from the time you receive the payment confirmation from La Trobe Abroad for the money to be processed and reach your bank account. If your program requires you to pay up-front fees or deposits prior to your program commencement, it is important that you seek alternative funding to cover these costs in the time-being. If you do not receive your money within the payment period, you can email us to follow-up for the status. Some short programs have New Colombo Plan (NCP) funding available. Please check with La Trobe Abroad, your course coordinator or the placements team for more information. These are all paid in addition to any grant listed above. Domestic students may also apply for the interest-free OS HELP Loan for additional financial support. You can apply for this loan after your subjects have been approved for credit (see step 1 of the application process). La Trobe University does not award mobility grants and scholarships to students retrospectively.